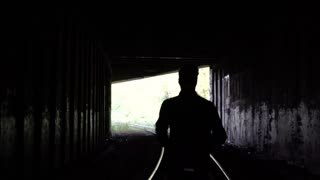 Slow motion man silhouette running on train tracks. Back view. Abstract background ending shot. In pursuit for freedom. Slow motion running on grass tiles to the city. Back view. Abstract background shot. Concept of pursuing life goals. Slow motion. 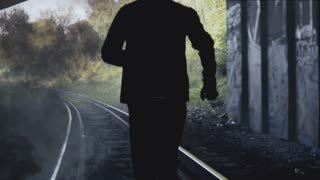 Man running forward on railway. Back view. Abstract silhouette shot. Concept of following your dreams. 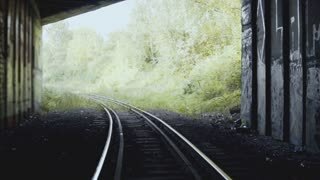 Slow motion man running out of dark smoke tunnel. Back view. Abstract silhouette shot. Life and death. Escaping danger. 4K Concept of depression. Dark man silhouette. Back view. Abstract cinematic shot. 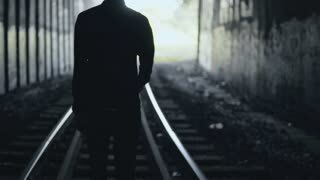 Male walking in a railway tunnel. Back view of happy young tourist woman with backpack watching rushing water at Niagara Falls waterfall slow motion.